Abilene was first settled in 1856. The name, taken from the Bible, means "city of plains". It was a small hamlet until 1867 when Joseph McCoy decided it would make a good place as a terminus for Texas cattle drives. McCoy selected Abilene because it was a good source of water and grass. McCoy built facilities for pasture and hospitality. After an advertising campaign, 35,000 head of cattle arrived in Abilene in 1867. Its importance grew when in 1870 the Kansas Pacific Railway linked it to Ellsworth and Denver. 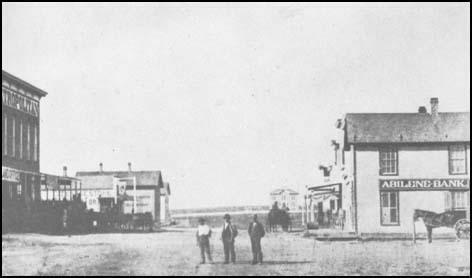 As Abilene grew it attracted small businessmen to the area who established saloons, brothels and various stores. It also became the source of a great deal of crime and lawlessness. In an attempt to restore order, Tom Smith was appointed marshal of Abilene in June, 1870. Smith immediately announced that it was now an offence to carry guns within the city. Although he carried a gun, Smith attempted to enforce the law with his fists. His decision to ban guns was unpopular with some members of the community and during the next few months he survived two assassination attempts. As a result of his ability to maintain law and order, Smith was also appointed under sheriff of Texas. On 2nd November 1870, Tom Smith was sent to a small settlement 10 miles from Abilene to arrest Andrew McConnell, a man charged with murder at Detroit. McConnell shot Smith and his friend, Moses Miles, killed him with a blow to the head with an axe. Wild Bill Hickok was now chosen as the new marshal of Abilene. He was paid $150 a month plus a percentage of the fines. Hickok also received 50 cents for every unlicensed dog he shot. Hickok did not take his duties seriously and spent most of his time playing poker. 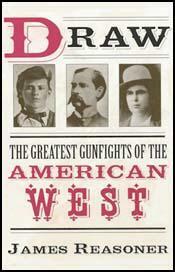 Hickok was eventually sacked by the city council in 1872 when he killed a fellow lawman in a gunfight. The city council now decided to take a different approach and decided to ask the Texas cattlemen to stop bringing their cattle to Abilene. This they decided to do and Abilene's reputation as a lawless town came to an end. On last Sunday a terrible tragedy occurred at one of the dens of infamy, just suppressed north-west of town. It seems that a young man named Charles Fay, was visiting the house, when an altercation took place between himself and a man named Thomas Galloway. Another man named Warren Howell joined in the fracas and fired several shots at Fay. Fay was finally shot through the head, it is said by Galloway, and killed. C. C. Kuney, caused an inquest to be held on the dead body, and the jury found that Fay came to his death by a pistol shot from the hand of Thomas Galloway, and also that Warren Howell aided and assisted in the murder. Howell was promptly arrested and lies in jail awaiting trial at the next term of the District Court. Galloway has thus far eluded arrest. The authorities would do well to offer a reward of $500 or more for his body. It is time that thieves and murderers be cleaned out of this part of the State. The people of Abilene, with scarcely an exception, unite in saying that the murder on last Sunday was a most cowardly, cold-blooded act. The murdered man did not offer to defend himself. It is said that he did not believe, until too late, that a murderous assault would be made upon him. The three men were from Texas. Heretofore the Texans have not been interfered with much, by the officers of the law in this locality, when they killed each other. But the time has come when violators of the peace must be punished, no matter where they may hail from. We know that every respectable Texan condemns lawlessness and violence, and is in favor of order and good morals - as are all intelligent, respectable men, whether from Texas or elsewhere. We believe that no citizen of Dickinson county has ever committed the crime of murder, and we hope that we shall never again be under the necessity of chronicling a murder perpetrated within the limits of the county. We regret to learn that a fatal affray took place on last Sunday afternoon, near Chapman Creek, between two neighbors named John Shea and Andrew McConnell. The facts as related to us are substantially as follows: It seems that McConnell had been out with his gun hunting deer, on his return he found Shea driving a lot of cattle across his land. Some words passed between them, when Shea drew a revolver and snapped it twice at McConnell who stood leaning on his gun, and being on his own land. As Shea was cocking his pistol for the third time, McConnell drew up his gun and shot Shea through the heart, killing him instantly. McConnell went for a Doctor, and afterwards gave himself up, and had an examination before Mr. Davidson on last Tuesday, when a neighbor of both men, Mr. Miles, testified substantially to the above facts, and McConnell was discharged - the act having been done in self-defence. Shea leaves a widow and three children. Last week we chronicled a terrible affair, which occurred on Chapman Creek, resulting in the death of John Shea at the hands of Andrew McConnell. McConnell gave himself up, and upon the testimony of a man named Miles was released. Miles swearing that the act was done in self-defence. But it afterward appeared to some of the neighbors, from unmistakable circumstances, that Shea was not the aggressor, and a warrant was issued for the re-arrest of McConnell. On Wednesday of this week officers T. J. Smith, and J. H. McDonald, went out to McConnell's dugout to arrest him. Upon reaching the dugout they found McConnell and Miles. Officer Smith informed McConnell of his official character and that he had a warrant for his arrest, whereupon McConnell shot Smith through the right lung; Smith also fired, wounding McConnell; the two being close together grappled; Smith, although mortally wounded, was getting the better of McConnell, when Miles struck him on the head with a gun, felling him senseless to the ground, and seizing an ax chopped Smith's head nearly from his body. At this stage of the tragedy officer McDonald returned to this place for assistance. A posse was raised, and repaired to the scene of the murder, but McConnell and Miles had fled, and up to this morning had not been arrested. They were both wounded, and it is reported were in Junction City last evening. It is hoped that they will be speedily arrested. We give the above named particulars as we gather them from reports current in town. The body of Mr. Smith was brought to this place last evening, and will be buried at 10 o'clock tomorrow. The sad event has cast a gloom over our town. Our citizens had learned to respect Mr. Smith as an officer who never shrank from the performance of his duty. He was a stranger to fear, and yet in the private walks of life a most diffident man. He came to this place last spring, when lawlessness was controlling the town. He was at once employed as chief of police, and soon order and quiet took the place of the wild shouts and pistol shots of ruffians who for two years had kept orderly citizens in dread for their lives. Abilene owes a debt of gratitude to the memory of Thomas James Smith, which can never be paid. Although our people will never again permit the lawlessness which existed prior to his coming to the town, yet it will be a long time before his equal will be found in all the essentials required to make a model police officer. Sacred be the memory of our departed friend and green be the turf that grows upon his grave. In years to come there will be those who will look back to the days when it required brave hearts and strong hands to put down barbarism in this new country and among the names of the bravest and the truest none will be more gratefully remembered than that of Thomas James Smith, the faithful officer and true friend of Abilene. The Chief of Police (Bill Hickok) has posted up printed notices, informing all persons that the ordinance against carrying fire arms or other weapons in Abilene, will be enforced. That's right. There's no bravery in carrying revolvers in a civilized community. Such a practice is well enough and perhaps necessary when among Indians or other barbarians, but among white people it ought to be discountenanced. to bravery or chivalry. To stand up and shoot at a man who has an equal chance with you, indicates that you are not a coward, but to fire at a man when you know that he is defenceless and can't return the compliment, is next to the lowest species of cowardice known among men. Before dark you will have an opportunity to notice that Abilene is divided by the railroad into two sections, very different in appearance. The north side is literary, religious and commercial, and possesses... Wilson's Chronicle, the churches, the banks, and several large stores of various description; the south side of the road is the Abilene of "story and song," and possesses the large hotels, the saloons, and the places where the "dealers in card board, bone and ivory" most do congregate. When you are on the north side of the track you are in Kansas, and hear sober and profitable conversation on the subject of the weather, the price of land and the crops; when you cross to the south side you are in Texas, and talk about cattle, varied by occasional remarks on "beeves" and "stock." Nine out of ten men you meet are directly or indirectly interested in the cattle trade; five at least out of every ten, are Texans. As at Newton, Texas names are prominent on the fronts of saloons and other "business houses," mingled with sign board allusions to the cattle business. A clothing dealer implores you to buy your "outfit" at the sign of the "Long Horns"; the leading gambling house is of course the "Alamo," and "Lone Stars" shine in every direction. At night everything is "full up." The "Alamo" especially being a center of attraction. Here, in a well lighted room opening on the street, the "boys" gather in crowds round the tables, to play or to watch others; a bartender, with a countenance like a youthful divinity student, fabricates wonderful drinks, while the music of a piano and a violin from a raised recess, enlivens the scene, and "soothes the savage breasts" of those who retire torn and lacerated from an unfortunate combat with the "tiger." The games most affected are faro and monte, the latter being greatly patronized by the Mexicans of Abilene, who sit with perfectly unmoved countenances and play for hours at a stretch, for your Mexican loses with entire indifference two things somewhat valued by other men, viz: his money and his life. It may be inferred from the foregoing that the Texan cattle driver is some what prone to "run free" as far as morals are concerned, but on the contrary, vice in one of its forms, is sternly driven forth from the city limits for the space of at least a quarter of a mile, where its 'local habitation" is courteously and modestly, but rather indefinitely designated as the "Beer Garden." Here all that class of females who "went through" the Prodigal Son, and eventually drove that young gentleman into the hog business, are compelled to reside. In the amusements we have referred to does the "jolly drover" while the night away in Abilene. Day in Abilene is very different. The town seems quite deserted, the "herders" go out to their herd or disappear in some direction, and thus the town relapses into the ordinary appearance of towns in general. It is during the day, that, seated on the piazzas of the hotels, may be seen a class of men peculiar to Texas and possessing many marked traits of character. We allude to the stock raisers and owners, who count their acres by thousands and their cattle by tens of thousands. Two men were shot at Abilene, Thursday evening. The circumstances were about as follows, so our informant says: Early in the evening a party of men began a spree, going from one bar to another, forcing their acquaintances to treat, and making things howl generally. About 8 o'clock, shots were heard in the "Alamo," a gambling hell; whereupon the City Marshal, Hickok, better known as "Wild Bill," made his appearance. It is said that the leader of the party had threatened to kill Bill, "before frost." As a reply to the Marshal's demand that order should be preserved, some of the party fired upon him when, drawing his pistols "he fired with marvelous rapidity and characteristic accuracy," as our informant expressed it, shooting a Texan, named Coe, the keeper of the saloon, we believe, through the abdomen, and grazing one or two more. In the midst of the firing, a policeman rushed in to assist Bill, but unfortunately got in the line of his fire. It being dark. Bill did not recognize him, and supposed him to be one of the party. He was instantly killed. Bill greatly regrets the shooting of his friend. Coe will die. The verdict of the citizens seemed to be unanimously in support of the Marshal, who bravely did his duty. On last Thursday evening a number of men on a "spree" and compelled several citizens and others to stand treat, catching them on the street and carrying them upon their shoulders into the saloons. The crowd served the Marshal, commonly called "Wild Bill," in this manner. He treated, but told them that they must keep within the bounds of order or he would stop them. They kept on, until finally one of the crowd, named Phil Coe, fired a revolver. The Marshal heard the report and knew at once the leading spirits in the crowd numbering probably fifty men, intended to get up a "fight." He immediately started to quell the affair and when he reached the Alamo saloon, in front of which the crowd had gathered, he was confronted by Coe, who said that he had fired the shot at a dog. Coe had his revolver in his hand, as had also other parties in the crowd. As quick as thought the Marshal drew two revolvers and both men fired almost simultaneously. Several shots were fired, during which Mike Williams, a policeman, came around the corner for the purpose of assisting the Marshal, and rushing between him and Coe received two of the shots intended for Coe. The whole affair was the work of an instant. The Marshal, surrounded by the crowd, and standing in the light, did not recognize Williams whose death he deeply regrets. Coe was shot through the stomach the ball coming out through his back; he lived in great agony until Sunday evening; he was a gambler, but a man of natural good impulses in his better moments. It is said that he had a spite at Wild Bill and had threatened to kill him - which Bill believed he would do if he gave him the opportunity. One of Coe's shots went through Bill's coat and another passed between his legs striking the floor behind him. The fact is Wild Bill's escape was truly marvelous. The two men were not over eight feet apart, and both of them large stout men. One or two others in the crowd were hit, but none seriously. We had hoped that the season would pass without any row. The Marshal has, with his assistants, maintained quietness and good order - and this in face of the fact that at one time during the season there was a larger number of cut-throats and desperadoes in Abilene than in any other town of its size on the continent. Most of them were from Kansas City, St. Louis, New Orleans, Chicago, and from the Mountains. We hope no further disturbances will take place. There is no use in trying to override Wild Bill, the Marshal. His arrangements for policeing the city are complete, and attempts to kill police officers or in any way create disturbance, must result in loss of life on the part of violators of the law. We hope that all strangers as well as citizens, will aid by word and deed in maintaining peace and quietness.